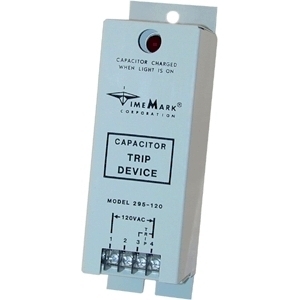 The Model 295 Capacitor Trip Device is used to trip circuit breakers requiring an AC voltage, by using the stored energy in a capacitor. The capacitor is kept at full charge during normal operation by a half-wave silicon rectifier which draws its energy from the power line. When completely discharged, the Model 295 draws approximately 10 amps from the line in the first half cycle, 3 amps the second half cycle and 1 amp from the third. Continuous current required to keep the capacitor charged is less than 5 milliamps. The capacitor holds sufficient charge to trip the breaker for at least 12 seconds after the charging voltage is removed. However, on most fault conditions, some voltage is still present, so the Model 295 is designed so that 65% of normal voltage gives sufficient charge to trip the breaker. A low-energy lamp, connected in parallel with the storage capacitor, gives a visual indication when the voltage charge is 85 volts or more on the 120V version and 170 volts or more on the 240V version. 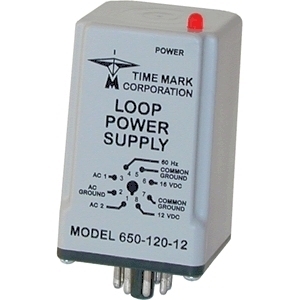 The Model 650 Loop Power Supply provides DC power for instrumentation control modules. Each option provides three output selections. For example the Model 650-240-24 has output options of 24 VDC regulated, 32 VDC unregulated, and 60 Hz pulse at 46 peak volts (See datasheet for all output selections). All outputs for the Model 650 are floating, electrically isolated from ground. A power status indicator (LED) is located on the top of the unit. The POWER LED comes ON when power is applied. Applications for this device include two-wire current loop transducers, such as pressure, voltage or current. The Model 650 may also be used with alarm indicators, meters and timers. 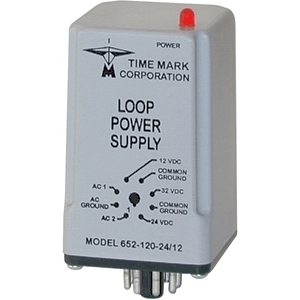 The Model 652 Loop Power Supply provides DC power for instrumentation control modules. Each option provides three output selections. For example, the Model 652-12 has output options of 12 VDC regulated, 16 VDC unregulated, and 5 VDC regulated. All outputs for the Model 652 are floating, electrically isolated from ground. A power status indicator (LED) is located on the top of the unit. The POWER LED turns ON when power is applied. Applications include two-wire current loop transducers, such as pressure, voltage or current. The Model 652 may also be used with alarms indicators, meters and timers.